2. Preschool for all children, he argued, would boost graduation rates as well as reduce teenage pregnancy and violent crime. “I propose working with states to make high-quality preschool available to every child in America,” he said. On Wednesday, Obama visited a pre-school in Decatur, Ga., telling an audience of teachers, parents, and students that “education has to start at the earliest possible age.” Obama’s proposal would guarantee pre-school at age four for all children from poor and working-class backgrounds. He said also that he would support local initiatives to provide education for middle-class four-year-olds, as well as for infants and toddlers from low-income families. 3. Higher rewards for high-tech education to prepare graduates for a high-tech economy. This non-specific initiative would “redesign America’s high schools” to prepare students with the skills and knowledge needed for today’s jobs. “We’ll reward schools that develop new partnerships with colleges and employers, and create classes that focus on science, technology, engineering, and math – the skills today’s employers are looking for to fill jobs,” Obama said. He also seemed to indicate that every student doesn’t need to go to college if he/she can learn the appropriate technological skills in high school. He referenced “those German kids” who attend schools that provide the technological skills that equip them for a job when they graduate. He pointed to P-Tech in Brooklyn, where graduates leave with a high school diploma and associate’s degree in a high-tech field. 4. Better school buildings could be among the priorities in his “Partnership to Rebuild America,” a plan to attract private capital to help with construction projects. 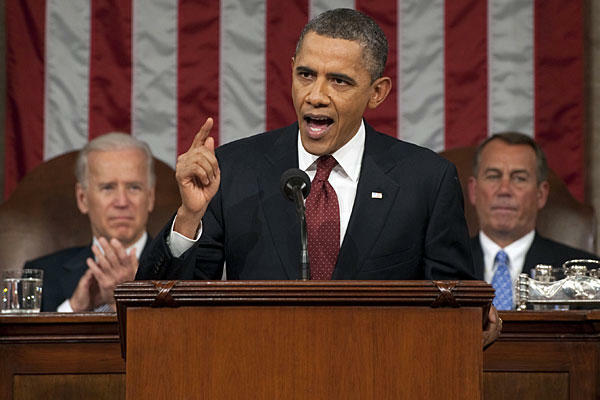 The National PTA was generally pleased with the State of the Union address, particularly his call for alleviating the impact of sequestration on education, ensuring school safety, providing early-childhood education, helping students become ready for college and careers, and engaging fathers in the lives of their children. But it was disappointed that the comprehensive reauthorization of the Elementary and Secondary Education Act (ESEA) was not mentioned. This year, National PTA wants Congress to take bipartisan action to address changes to the law governing the federal role in public education. The organization is especially interested in promoting meaningful family engagement via federal mandate. “Despite bipartisan consensus on the importance of family engagement in education, there remains no central mechanism to translate federal family engagement policies into general practice in states and local communities. Thus, there is little evidence that states, districts, and schools are implementing ESEA-NCLB’s family engagement provisions to meaningfully engage families in the education of their children,” according to the PTA’s 2013 Public Policy Agenda report.